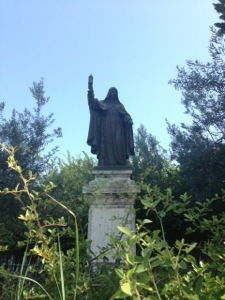 Today is the Feast of St Francis of Assisi, which has always been a notable feast for me but which has taken on greater significance after I spent three recent weeks in Assisi. That town is rich in Franciscan history, not so much in Franciscan spirituality (don’t go there looking for austerity or simplicity! 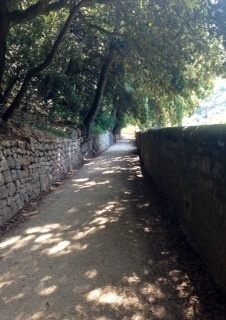 ), but I still managed to learn much about myself as well as about Francis while I was there. It was a place of prayer. Not everything I’ve learned from Francis was learned this past summer. Similarly, some of these lessons came from multiple sources. Here, on Francis’ Feast day, I offer you seven things he’s taught me from across the centuries. Francis and Clare were besties. At least that’s how I usually describe it in class. They were friends who planned together, who prayed together, who talked of spiritual matters and the everyday. This fellowship, rooted in love, is not easy to come by, and it is even more remarkable for companions of different genders in this era. As someone who has always had close friendships with men and women, I appreciate this model of a life-giving friendship. Of course, Francis is noted for assembling a community of brothers as well. Then, as now, I am sure that not all of the brothers would consider themselves friends, but the nature of an intentional, healthy community is one that values togetherness and collaboration regardless of the biases of personal preference. I am an extrovert, someone who gets energy from being around people. That is why it is essential that I get away from people from time to time. Visiting L’Eremo delle Carcieri, a hermitage to which Francis escaped up the hill from the town of Assisi, offered an astonishing vision of the level of isolation that Francis’ sought. I don’t think I need to go quite so far as to find a tiny cave as Francis did. As I seek a balance of hermitage and community, I try not to become compulsed by either. It can be just as tempting to escape into a large crowd as it is to escape into a cave. Though I can be melodramatic in my personal life, I don’t find myself often in a position to make grand actions like Francis did. Instead, I save all of the drama for ritual: the things we “act out” that show what we’re about. It’ s no secret that I love liturgy, and I’m learning that it is my way of acting out the drama that swirls around in my soul all the time. At a certain point, spirituality has to let go and accept the irrationality that occasionally governs our lives. Sometimes, we just get a miracle. Best not to ask too many questions. 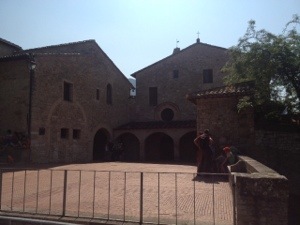 It’s conventional wisdom that when Jesus appeared to Francis in a vision and said “Repair my church”, he meant the universal church, but Francis “didn’t get it” and set about rebuilding San Damiano. Maybe Francis got it more than we give him credit for. Instead of over-analyzing the message, coming up with a strategic plan, dreaming big, etc, he just got down to work and the rest of it all fell into place. That’s all. It’s all grace. Do you have any association with or affection for St Francis? What have you learned from his life? He was someone not afraid to put what he believed — and more importantly, his faith — into action. Integrity requires courage, particularly when what God requires of us is the opposite of comfortable and acceptable. I don’t know the philosophy as well as I know the life. Service. And more service. When I’m not sure what to do next, which way to go I can always find my way out by asking what will be of most use to those around me? Because of you and other Catholics I’ve learned a lot about Jesuits and Benedictines and truly appreciate them (rah! Jezzies!!) but it always comes back to Francis. “Make me an instrument of Your peace.” Amen.